Although there are already a few existing compounds for use in the treatment of bone diseases, these new compounds may have efficacy exceeding that of current commercial species. In some cases, existing treatments have high toxicity and low efficacy. These new compounds may, therefore, be better than existing therapeutic options. These new compounds can help restore the natural balance between normal bone destruction and replacement. They are also potential candidates for the treatment of cancer and infectious diseases as related compounds have been shown to kill tumor cells and parasites. They have been shown to stimulate T-Cells, assisting in the treatment of cancer and infectious diseases. They have multiple targets, some involved in regulating apoptosis, and displays increased potency, making it a possible cancer drug. Its improved cell availability lowers the effective dose and can lead to fewer side effects. These compounds make up a series of bisphosphonates useful for the treatment of bone-related diseases, cancer and infections caused by protozoa and bacteria. The compounds represent new compositions of matter. Current clinical Bisphosphonates contain a nitrogen atom that can be positively charged. The new compounds have positively charged P, As, Sb, S, Se or Te sites instead of nitrogen. They may have higher activity in treating a variety of diseases than existing compounds and may have lower toxicity than existing compounds. can induce excessive apoptosis of alveolar lining epithelial cells leading to lung carcinogenesis. Dr. Sarlah from the University of Illinois at Urbana-Champaign has developed a new synthesis method for the anticancer agents pancratistatins. This method is based on dearomative carboamination of the benzene ring and is the shortest and most efficient known to date. Aditionally, the method could allow synthesis of novel analogs with biological activity. Dr. Hergenrother from the University of Illinois at Urbana-Champaign has developed a series of topoisomerase inhibiting small molecules with anticancer activity. These molecules possess comparable activity and selectivity to doxorubicin, a common cancer chemotherapy drug, across a range of cancer cell lines. These small molecules are a promising alternative to cardiotoxicity producing doxorubicin as a cancer chemotherapy drug. These molecules are also useful as broad-spectrum antibiotics capable of treating resistant bacteria strains (minimum inhibitory concentrations as low as 0.5 micrograms/mL for S. aureus and E. coli). 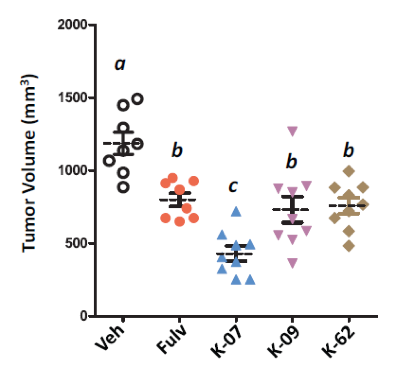 Dr. Hergenrother from the University of Illinois at Urbana-Champaign has developed a new synergistic combination therapy using the small molecule PAC-1 and kinase inhibitors for treatment of uveal melanoma. There are no current targeted therapies against this type of cancer, making this combination treatment a promising one. Dr. Zimmerman from the University of Illinois at Urbana-Champaign has developed an oligomeric ligand that can have potential applications in the treatment of DM1. This Ligand on account of its multivalent nature, is an improvement over the previous small molecule (TF12039) designed by the inventor. The oligomeric ligand has been shown to rescue mis-splicing activity in DM1 cell models. Climbing defects in adult DM1 drosophila flies was also show to have been rescued on treatment with this oligomeric ligand. Dr. Katzenellenbogen from the University of Illinois at Urbana-Champaign has developed a novel class of inhibitors capable of inhibiting Toll-like Receptor signaling. These compounds will allow treatment of inflammatory diseases such as sepsis. Currently there are no TLR inhibitors on the market and this novel set of compounds show higher affinity than currently published compounds. In addition to high specificity for TLRs these compounds are also able to be derivatized for specificity to specific classes of TLRs. Dr. Aditi Das from the University of Illinois at Urbana-Champaign has developed a novel set of therapeutic endocannabinoid derivatives. These derivatives retain the anti-inflammatory, anti-cancerous, anti-angiogenic, and anti-platelet aggregatory properties while having an increased half life. As these compounds are based off endogenous endocannabinoids it is predicted side-effects will be miminal. Importantly these derivatives show enhanced anti-migratory properties compared to the endogenous compound suggesting they will act as potent drugs.